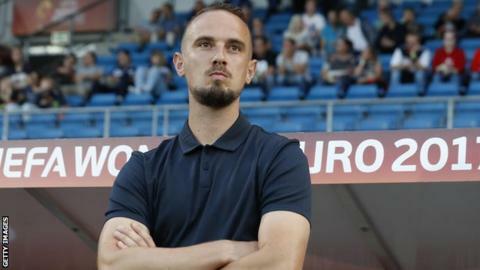 Former England women's manager Mark Sampson says he will "forever regret" the situation following his sacking. Sampson, 36, reached a settlement with the Football Association on 9 January, 16 months after he was fired. An investigation into racially discriminatory remarks he made to two England players, for which the FA apologised, was then subject to a parliamentary inquiry. Sampson told The Times it was "the most difficult time of my life". "You are so scared of the impact it will have on the people you love," he said of the investigation being "played out so publicly". Welshman Sampson's sacking in September 2017 came after evidence emerged of "inappropriate and unacceptable" behaviour with female players in a previous role at top-flight side Bristol Academy, now renamed Bristol City Women. He became England head coach in December 2013 and led The Lionesses to a bronze medal at the 2015 Women's World Cup. After he was fired, the FA said it was made aware of the full details of safeguarding allegations made against Sampson in 2014 relating to his time as Bristol Academy manager. A 2015 FA assessment found Sampson did not pose a risk. Outgoing FA chief executive Martin Glenn revisited the report in 2017, with FA chairman Greg Clarke saying Sampson should have been sacked "years ago". "I wasn't as mature as I should have been during my time at Bristol," Sampson said. "My behaviour was unprofessional, which I acknowledged. I crossed a professional boundary. I shouldn't have and I fully recognised that." Before his dismissal, Sampson was cleared of wrongdoing following discrimination allegations made by England players Eniola Aluko and Drew Spence. The handling of both cases was subject to a Digital, Culture, Media and Sport select committee hearing in October 2017, at which Clarke, Glenn and outgoing FA technical director Dan Ashworth were all summoned to appear. The FA then apologised to Aluko and Spence for Sampson's racially discriminatory remarks after an independent barrister ruled he made unacceptable "ill-judged attempts at humour" on two occasions. Sampson says he "apologises to Drew and Eni unreservedly" and regrets not playing a "much more active role" to ensure their complaints "were handled more respectfully". He says he has since reached out to Kick It Out chair Lord Ouseley, who invited Sampson for a coffee and "really positive conversation" at the Houses of Parliament. "As a white male I needed to do more and I've worked hard to educate myself," he added. "I spent six weeks with Kick It Out on their educational course for equality and diversity. I need to play a more active role in making a difference. It's something I will do for the rest of my life." Sampson, who stands by the culture within his England team as "a key ingredient in reaching a first World Cup semi-final", says he knows his actions contributed to putting him in a position where his behaviour was subject to investigation, but added: "I can't lie, it's hard." "Not a night or day has gone by where it hasn't dominated my thoughts, and that will continue for a long time," he said. "The way the whole situation was handled I'll forever regret."